The amount of complaints being received regarding digital advertising is on the decline, according to the annual ad complaints report published by Ad Standards. This continues a trend that has materialized over the last few years in which year after year, those numbers have gone down. Ad Standards, the organization that publishes these reports annually, is independently founded by people from within the ad industry. Its purpose is to provide an avenue for consumers to voice their concerns over advertising practises across all mediums. Ad Standards will then review those complaints, and if deemed unacceptable, it will work to then resolve those issues with the advertiser or send them along to its council for further review; striving for an advertising industry that fits within the Canadian Code of Advertising Standards. 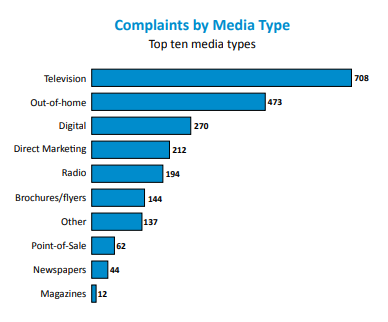 Out of the total 1,205 complaints that it received in 2018, Ad Standards’ report says that 270 of those were for the digital medium. That number is down from 410 in 2017 and 439 in 2016. This could be a correction to the advertising market, following the popularization of using Facebook Ads and other digital advertising platforms for nefarious reasons, which was publicly addressed in Senate hearings in the U.S. in 2018. The biggest culprit when it comes to complaints received was television, as it has been for quite a long time, with 708 complaints. Of the 1,205 complaints submitted last year, 747 were found to be legitimate and were reviewed and 167 were found to have breaches of the Canadian Code of Advertising Standards. Of those with violations found, 104 were able to be resolved administratively and 63 needed to be referred to the council for adjudication. Anyone who would like to submit a complaint can do so from Ad Standards website.